Imagine owning your own home right here in Darwin…now with our exclusive Home & Land packages this could be your reality! Abode New Homes has been building homes for Territorians for over 15 years, so you can be comfortable knowing with our help and expertise this entire process becomes easy and stress free! A common misconception is that it is hard and complicated to build a home but …with our simple and proven 3 step process you too could be moving into a brand-new home in as little as 16 weeks^ and with our dedicated client portal you will have live up to date information available to track your progress! We can help you with everything from finance options through to landscaping design and if you are a first home owner you may even qualify for No Deposit Finance. If you are not a first home buyer and have $15K in savings and a combined income of over $100K then you too could be entertaining your friends in a beautiful new home! By dealing direct with your builder you will be at ease knowing we value client relationships from the begining and for years to come to help you maintain your home. The Northern Terrritory has amazing incentives to help the likes of you into a brand-new home and we are here to help you access all of the information and grants available. Infact there is no where else in Australia that offers these once in a lifetime opportunities. We are here to guide you every step of the way! STEP 1: Obtain Finance – its as easy as submitting your details below to see if you meet the criteria! STEP 2: Decide where you would like to live. STEP 3: Select from one of our floorplans and make it your own! Relax…Let us do the hard work! We have put together these exclusive packages to include everything you could ever wish for in a home! Hurry…these packages won’t last long! To see if you are eligble for the current government incentives enter your details above or call 13000 ABODE so we can show you the way to a brighter future! Free… Concrete POOL for everyone to enjoy! To see if you are eligible for NO Deposit or LOW Deposit Finance enter your details below and we will let you know within 24hrs. 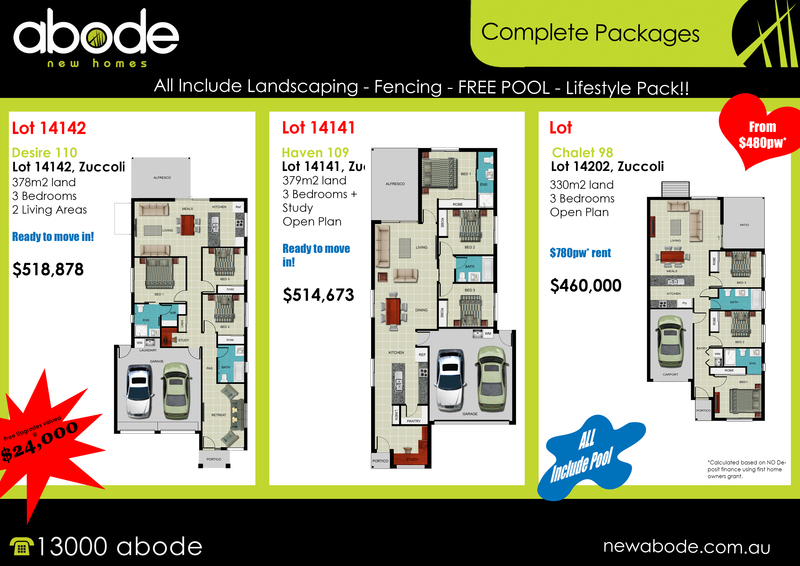 Free pool giveaway and $24k worth of premium inclusions applies to Lot 14141, Lot 14142 and Lot 14202 in Zuccoli Aspire. Seperate Land and Build contract apply. Pool provided is a 3m x 4.5m Concrete Plunge Pool finished in pebblecrete including filtration, certified pool fencing and surrounding concrete. Finance is provided by an external party Abode New Homes does not offer financial advice, finance qualification is handled by a third party licensed mortgage broker. The Haven 109 and Desire 110 designs apply to lot 14141 and lot 14142. The Chalet 98 design applies to lot 14202. Any changes or variations to designs or inclusions may incur additional charges. ^16weeks is calculated from the completion of the concrete slab and may vary as per contract terms.